Chaco Culture National Historical Park, also known as Chaco Canyon, is the largest excavated prehistoric ruins in North America and is a must see for history buffs and outdoor lovers! 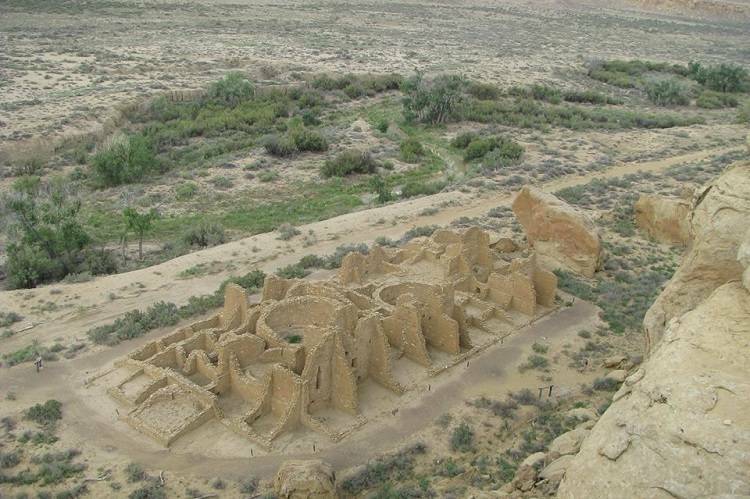 Chaco was the center of the ancestral Puebloan culture from AD 850 to 1200. Attractions within the park include Chacoan great houses, kivas, rock art and stunning vistas. The hallmark Chacoan roads and geometric layout of structures captivates visitors from around the world. going to Chaco Culture NHP. A 9-mile long park loop road provides access to five of the Chacoan sites. It also provides access to several trail-heads for backcountry hiking and biking. Backcountry hikers should obtain a free hiking permit at the visitor center. Pets are allowed in the Park. The remote location of Chaco Canyon adds to the beauty and adventure of visiting this National Park. Main entrance into the park is from US Highway 550. From 550 turn onto CR 7900, (40 miles south of Farmington / 50 miles north of Cuba). This route is clearly signed from US 550 to the park boundary (21 miles). The route includes 8 miles of paved road and 13 miles of dirt road. The section of dirt road can best be described as "wash board". Visitors not accustomed to traveling on dirt roads need not worry, note the posted speed limits and keep in mind that the destination is well worth the 13 miles of dirt road. Please note that some roads recommended by Google, map publishers and mapping services using GPS are unsafe for passenger cars. The most recommended access point is from Highway 550, from CR 7900. The road to Chaco can become impassible in inclement weather, If rain, snow or thunderstorms are in the forecast simply call the visitor center or visit their website for road conditions and park closures. Chaco Culture National Historical Park preserves the monumental architecture and complex community life of a major center of ancestral Puebloan culture (Anasazi) that took root and flourished for a thousand years. The Chacoan culture began to flourish in the canyon in the mid-800s with continual habitation and building lasting for another 300 years. The ancient Puebloan people (Anasazi) constructed massive stone buildings, called great houses, of multiple stories that are much larger than what had previously been built. Construction on some of these buildings spanned decades and even centuries. These structures were often aligned to solar, lunar, and cardinal directions and placed within a landscape surrounded by sacred mountains, mesas, and shrines. The buildings in the canyon are believed to be “public architecture” that were used periodically be the people for times of ceremony and commerce when temporary populations arrived in the canyon. By 1050, Chaco Canyon had become the political, economic, and ceremonial center for the Chacoan culture. Roads connected the canyon to over a 150 other great houses, including Aztec Ruins and Salmon Ruins to the north. Chaco Canyon became the trade center for turquoise, parrots, macaws, copper bells, and other precious commodities. By the mid-1100s the canyon began to decline as the regional center as new building ceased and influence moved to Aztec Ruins and other great houses. In time, the people moved away from the area and culture to reinvent themselves. Today the Pueblo Indians of New Mexico claim to be the descendants of the ancient Puebloans.